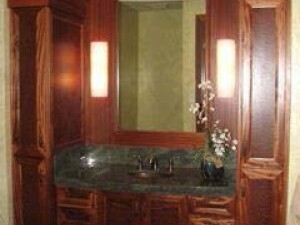 Since 1979, we have been offering custom cabinetry and counter tops. By using many different types of cabinet interiors, drawer box styles, and door and drawer fronts, we are able to supply cabinetry at all different kinds of price levels. This flexibility allows us to supply cabinetry within the budgets our clients have established. 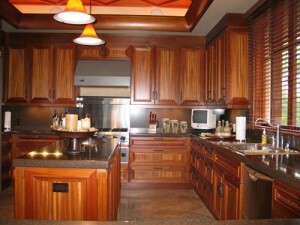 In the Kona area, we see clients work with alot of different woods, including the local woods, Koa, Ohia, Monkey Pod, Mango, etc. But some of our clients like to use a different hardwoods, such as, include African Mahogany, Afromosia, Maple, Cherry and Sapele. Cabinet interiors can vary, depending on your end use of the cabinetry. 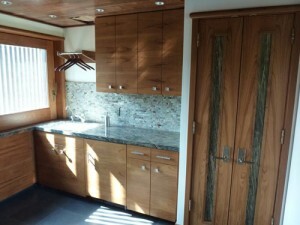 For typical cabinetry most people will use Maple or Birch plywood. But if you are adding cabinetry to your laundry or garage, you might want to consider a melamine plywood interior. Melamine plywood interiors will provide you with a durable and easy to clean surface. Hardware and Accessories have come along way. Today, most clients want to have the Blum 120 degree “Soft Close” hinges and the Blum “Motion” full extension drawer guides. You see these items advertised in association with cabinetry advertisements all the time. But, if budget is a concern, you might want to limit the use of some of these items. Cabinet accessories – is like ice cream on a cake, it makes a good thing even better. Most people will have the following items included in their kitchen cabinetry: Refuse Pullout (single or double baskets), Spice Trays (drawer style or pull out style), Utensil Tray, Cutlery Tray and Tray Dividers (for cookie sheets, cutting boards, platters, etc.). Depending on the area, kitchen, laundry, closet or bathroom, there are many options available. If you are looking for new cabinets, or replacing your existing door and drawer fronts, we would be pleased to show you the options available. Cabinets go anywhere you would like to organize a space: kitchen, laundry, bathroom, office, living room, bedroom, bbq, lanai or ? 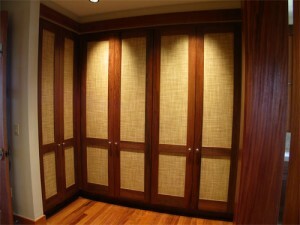 ?, we can build a cabinet to fit any space in your home.